Just like a diamond among stones, Abu Dhabi’s mangrove forest hides picturesquely amid its many developments. Who would’ve thought that this green haven will be teeming with so much of wildlife? Explore this gem of a beauty	by going on a kayaking tour. 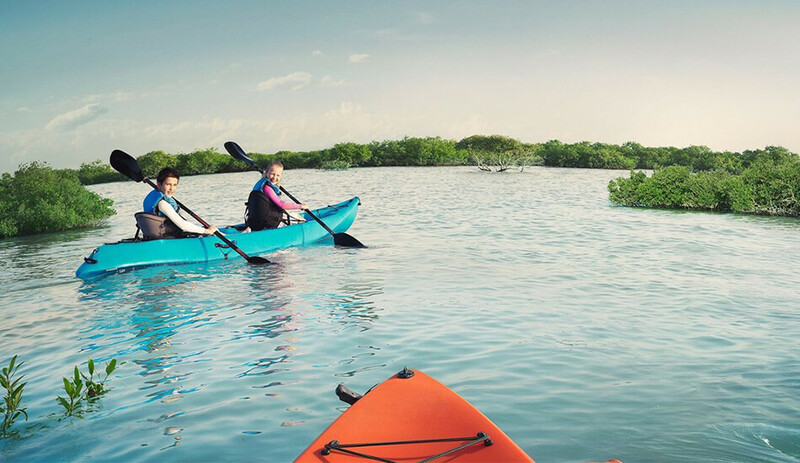 You will be accompanied by an experienced guide who will make the mangrove kayaking	Abu Dhabi experience memorable. Admire the gorgeous scenery as you paddle through the waterways sandwiched between	mangrove swamps. Listen to your guide’s commentary about the importance of the mangrove; learn more about its history and	the animals that live in it. Come cross many aquatic and terrestrial wildlife that call the mangrove home. Your tour	starts with a safety briefing after which you will explore the mangroves beautiful landscape and its inhabitants. This tour will make you marvel at the beauty Abu Dhabi hides behind its concrete curtain.